So you think you’re ready to buy medical imaging equipment. And maybe you are. But the reality is, many physicians, practitioners, clinic managers and medical administrators may THINK they’re ready to buy, but oftentimes, they haven’t even done the basic homework that will help them determine if they’re actually ready to buy. As you well know, medical imaging equipment is far from inexpensive, so let’s talk about the easiest way to determine 1) If you really need the equipment and 2) if you can really afford it. It all starts with the development of a business plan—or pro forma. By taking the time to answer key questions, you can determine the financial feasibility of any such purchase—and it can make it easier for you to convince others (investors, senior management, the CFO) that it’s time to buy, as well. Prepare realistic projections of the volume of patients and what the reimbursements will be per patient study. 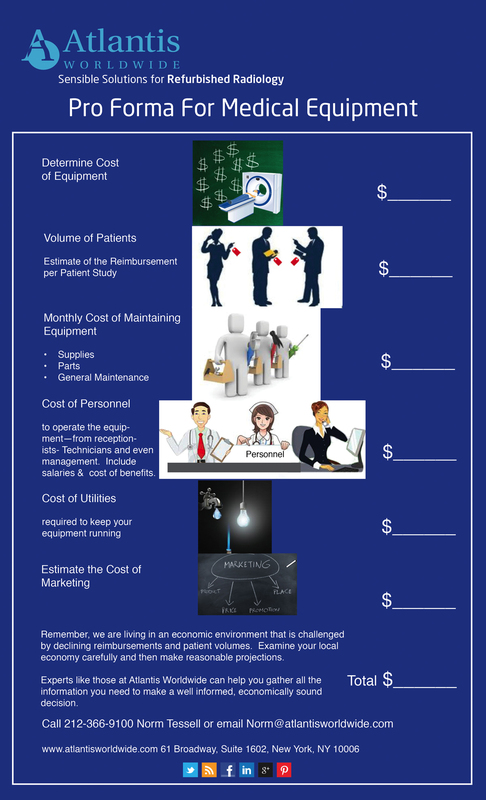 Estimate the monthly cost of maintaining your medical imaging equipment. This can include supplies, parts and general maintenance. Determine the real costs of the personnel required to operate the equipment—including receptionists, office staff, technicians and even management. Be sure to include salaries and the cost of benefits. Estimate the cost of utilities required to keep your equipment running. Be sure to include marketing costs in your business plan, as well. After all, it won’t do you any good to buy a new piece of medical imaging equipment if no one knows about it. This can include marketing efforts to physicians, clinics, practices and even potential patients. Make sure your projections aren’t inflated. Just as you are considering the purchase of a new piece of equipment, competing hospitals, clinics and facilities may do so, as well. Do a thorough competitive analysis in your market before whipping out the checkbook. Remember, we are living in an economic environment that is challenged by declining reimbursements and patient volumes. Examine your local economy carefully and then make reasonable projections. Once your homework is complete, then it’s time to determine if it’s wise to purchase medical imagining equipment. If the answer is “yes,” then it’s wise to determine if brand new equipment is the best solution, or if refurbished medical imagining equipment will give you the performance and quality you want, for a great deal less. Experts like those at Atlantis Worldwide can help you gather all the information you need to make a well informed, economically sound decision.